This is the headline from a (fictional) news article on the pages before chapter one. “Stunned residents of Black Creek, North Carolina, pray for seventeen-year-old Patrick Truman, beaten and left for dead outside the convenience store where he works. “’There was blood on his face. . .blood everywhere,’ says Dave Tuttle, the motorist who discovered the unconscious teen early Sunday morning. 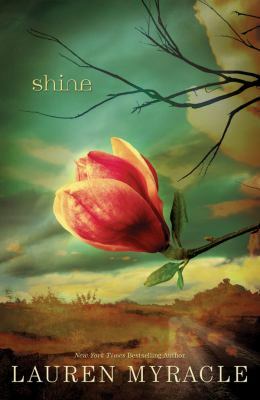 While Shine is a work of fiction—and thus not the story of Matthew Shepard—it clearly begins with the Matthew Shepard murder in mind, and a portion of the proceeds from the sale of the book benefit the Matthew Shepard Foundation. Black Creek is a small town of about 500 residents. The economic downturn hit the town particularly hard, and many of the young people have turned to partying hard—to drugs, including meth. Lots of them are dropouts, with little hope for the future. Many are dirt poor, and the details of their lives and how they try to add bright touches are heartbreaking. Cat, the novel’s narrator, hasn’t paid much attention to the change in Black Creek over the last three years. She’s withdrawn from all of her friends after being molested by a local (popular and mean) boy at the end of eighth grade. She’s hurt that her aunt, with whom she lives, just wants her to forget the incident and move on. But Cat’s withdrawal from friends includes a rift in her long-time relationship with her childhood best friend, Patrick Truman—the boy who was attacked at the convenience store. Without him, she has been adrift. As he lies in a coma in the hospital, she realizes she may never have the chance to talk to him again. When Sheriff Doyle doesn’t seem to be investigating the crime with any thought of finding the culprit(s), Cat realizes that he doesn’t want to know because it’s likely that a local teen committed the hate crime. It’s hard to guess what happened, as Patrick often hangs out with what Cat refers to as ‘the redneck posse,’ and it doesn’t seem any of them—no matter their prejudices—would hurt Patrick. Cat decides that she has to reenter the world of her small town and her friends, and help to find out what happened to her one time soul mate. While the novel’s end is a tad too tidy, it’s a good mystery as well as a story of prejudice and friendship, of religious hypocrisy, of hard luck and its consequences. A good read. This entry was posted in Controversial Issue/Debate, Family Problems, Fiction, Horror/Mystery/Suspense, Mature Readers, Young Adult Literature and tagged hate crime, poverty, rural life, small towns. Bookmark the permalink.